It's widely known that it's important to have a lot of color in our diet when it comes to your fruits and vegetables. The deeper the color, the better the vegetable. But that pertains to the color on their outside. A new study shows eating a lot of "white flesh" fruit - fruit that is white on the inside - could significantly reduce your risk of having a stroke - the third-leading cause of death in the U.S.
On "The Early Show" Friday, Prevention magazine Contributing Editor Dr. Holly Phillips said, "With strokes, the color on the inside matters more than the color on the outside. A new American Heart Association study ... looked at more than 20,000 people over ten years. And they found that people who had diets high in fruits that on the inside were white had a 52 percent lower risk of stroke. It was actually primarily apples and pears -- because they are white on the inside - (that were) linked with the lower risk of stroke." What is it about the white color that's so pivotal? "Two nutrients in particular," Phillips said. "The first is fiber. Fiber has been shown to lower your blood pressure, probably the most important factor for reducing stroke risk. Another is a flavonoid that prevents plaque building up in the arteries, which also prevents heart disease. "Both apples and pears, in particular, are high in those nutrients. 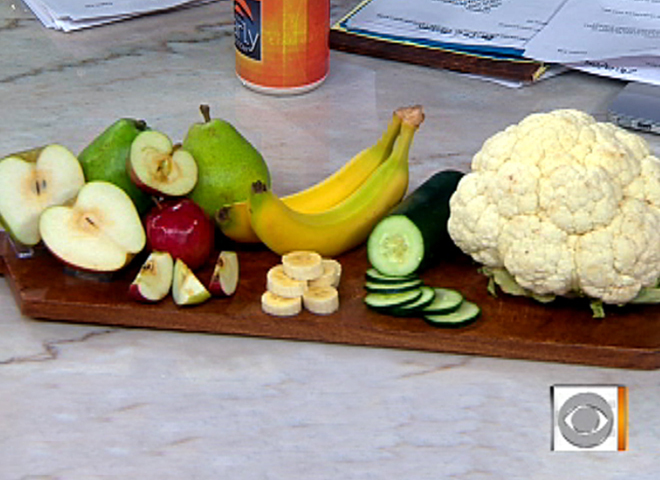 Cauliflower, cucumbers, bananas -- all of those things are high in those nutrients that prevent stroke." "The most important risk factors (for stroke), Phillips pointed out, "are high blood pressure and high cholesterol. Outside of that, if you cut out the smoking, you're cutting your risk dramatically. Diabetes is a risk factor, and a previous history of heart disease or a family history of stroke, they matter also. Phillips says, "One of the things I thought was so fantastic about this study it's easy to do. An apple a day can really make a difference. Outside of that, controlling your weight, exercise, things that really cut down on heart disease in and of themselves. Eating an apple a day is easy."